Told you another review was up soon. I assume you didn't need to guess for which movie? A life changing experience after an anxious 14 year wait? That's saying a little too much. A worthy successor to the first trilogy? Sure was. Not on par with the original Jurassic Park film of course, but whoever expected that knew they were deceiving themself. It was obvious from the get-go they would never rival the magic of that game changing film that revolutionized digital effects. In fact, there's plenty of those throughout the movie, but they are never as awe inspiring or jaw dropping as they were 22 years ago. To be honest, I would actually have preferred a more extensive use of animatronics, since a lot of people tend to forget JP proved to master their use to great effect specifically in combination with the digital aspect, both of them completing the other in bringing that dinomite magic about rather than fixing it on their own accord. JW opted for a 95 percent digital FX rate and it was a little too clear at times, but not so much it took you out of the movie. It's still a major Hollywood blockbuster with a huge budget after all. And it sure felt as one of those. In both a positive and a negative way. It didn't leave much room for narrative surprises, and the third act was largely an exercise in predictable storytelling, but it still handled it in such an epic way you could not help but roll with it despite your hesitations. There's a few instances in which the audience cheered and so did I, as if we were eight year old kids again (the increasingly strict Dutch rating system unfortunately won't allow kids of that age to experience the new Jurassic dawn, as JW has sadly been issued a '12' rating, despite not being more frightful than that first movie). Kids who had seen most of this stuff before in different guises though, but youthful exuberance abounded nonetheless. A contemporary blockbuster needs a star, and Chris Pratt is it for this film. Combining Alan Grant's common sense with Ian Malcolm's wit and wisecracking, the human hero of the piece certainly felt more heroic that any previous main human character in a JP movie. I don't mind for once, but I do hope the studio isn't gonna craft the next installments, unavoidable considering box office records are again being stamped on, around Pratt's persona and status, since few will deny the true stars are still the dinosaurs, as they should be. Those stars sure got a chance to shine, as JW provided the most amount of dinosaur time of any of the movies yet. The number of species portrayed easily rivals that of its predecessors, even giving the occasional formerly neglected species (like Ankylosaurus) their due. The most attention as always is directed at the carnivores, with JW dividing most of their screen time between a trained foursome of vicious but communicable Velociraptors and a genetic hybrid named Indominus Rex. Both the notion of taming Raptors and of creating mix-up dinosaurs is handled by director Colin Trevorrow with enough narrative and real world sense not to distance the legions of JP fanatics, as it easily could have done. Ample time is cleared to discuss the ramifications of both with more depth than is usual for a blockbuster film, before diving deeply into the dino fighting. That said, there's two prehistoric characters that are not featured as strongly as we would have hoped for, one being the iconic T-Rex which is intentionally kept out of most of the loop before making a most welcome resurgence. The other is the heavily advertized aquatic Mosasaurus, which unfortunately is allotted only a few more seconds of screen time than already seen in the promotional material, and thus ending up an underwhelming animal we would liked to have seen a lot more of, but which we are sadly denied. Executive producer Spielberg made the right choice hiring a fairly inexperienced director like Trevorrow for the Jurassic job. Trevorrow proves not only respective of the material and the franchise legacy, but he's clearly a JP fan himself. He shows it off in many scenes, both in composition of shots, score and sounds, but also in many references big and small to that most beloved movie from 22 years past. Potentially polarizing plot pitfalls are handled with the utmost care to make them plausible and relatable, thus adding his own signature to the thankfully enduring Jurassic Park legacy. 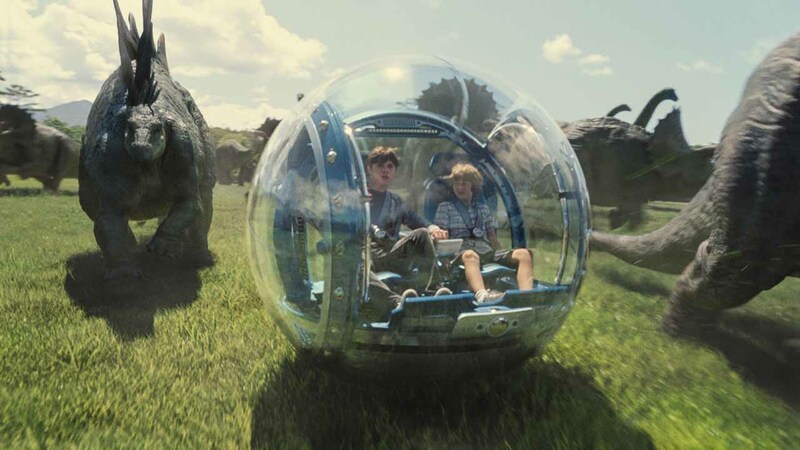 Though there's still a few things to hold against the movie, both in terms of plot (one-dimensional human bad guy, vague corporate shenanigans) as in execution (too little animatronics, too much reliance on digital creations), Jurassic World succeeds in taking us back to when dinosaurs ruled the Earth, and sparing no expense in guaranteeing they will continue to do so for another generation at least.